While your body needs fat for some functions, it is not okay to consume just any fat or too much fat. In fact, research has established that some types of fat can have serious adverse effects especially as a result of long-term consumption. (1) For many years, the sound bite from the leading health care experts was “eat no fat”. Yet taking out saturated fats meant replacing the saturated fat with something, usually refined carbs, such as white sugar or white flour. This replacement has been a disaster with no benefit and some decline in health. The subject of healthy and unhealthy fat is a contentious one with contradicting claims and counterclaims about the same products. Saturated fats and trans-fats are among the most misunderstood. This is expected, especially considering that for decades, trans-fats have been promoted as a healthier alternative to saturated fats. Trans-fats are made from plant sources and are referred to as vegetable fats. This is the premise upon which claims of trans-fats as a healthy alternative to saturated fats has been built. But, between saturated fats and trans-fats, which are healthier? Fats are a concentrated source of energy. They are also required for other functions in the body which include supporting growth of cells, keeping the body warm, and providing a protective cushion for body organs. Your body also requires fat for the absorption and assimilation of some nutrients including vitamins A, D, E and K, and to produce hormones. Fat in the diet helps to provide satiety, delaying hunger pangs. In this discussion, we are going to compare saturated fats with trans-fats. Is fish oil essential for healthy nutrition? The term saturated in saturated fats refers to the structural makeup of the fat molecules. Specifically, a fat is saturated if its molecules have a high number of hydrogen atoms surrounding the central carbon atom. In other words, the molecules are saturated with hydrogen atoms. And unlike unsaturated fats, saturated fats have no double bonds in their molecules. These properties make saturated fats very stable which is the reason why they are solid at room temperature. Saturated fats are naturally occurring and mainly come from animal sources. Foods containing saturated fats include butter, cheese, beef fat, lamb, pork, fatty beef, poultry with skin and lard. 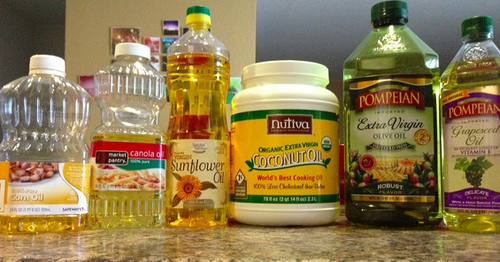 Coconut oil, palm oil and palm kernel oil are examples of saturated fat with plant sources. What makes saturated fats healthy? And while obesity can result from different factors, saturated fat is not as bad as was previously claimed. Various studies have also led to the conclusion that consumption of saturated fats does not increase the risk of heart disease. Saturated fats have many positive properties. For instance, consuming saturated fat helps the liver to shed fat cells which improves liver function. Saturated fats also raise testosterone levels in the bloodstream. This helps in tissue and muscle repair. It also improves male sexual function. Saturated fats especially those in butter and coconut oil help boost the immune function by supporting white blood cells to fight disease-causing bacteria and viruses. Do you consume coconut oil? Natural trans-fats are produced within the bodies of animals like cows. These trans-fats are found in dietary products made from such animals including milk and meat. These trans-fats are produced by hydrogenating, or adding hydrogen to vegetable oils. The industrial process called hydrogenation converts the vegetable oils into trans-fats which are solid fat at room temperature. Artificial trans-fats are very stable and, therefore, can remain unchanged for long periods of time. Additionally, artificial trans-fats are relatively cheap to produce. For these reasons, artificial trans-fats are used extensively to process many types of food, especially packed food products. Unfortunately, trans-fats have many adverse health effects. Trans-fats are the worst types of fat to eat. Fats have a 3 dimensional structure, like your house key. Trans fats extend like a lightning bolt, while cis fats return on themselves, like a horseshoe. Trans fats increase bad cholesterol or LDL, and lower good cholesterol or HDL in blood. This exposes you to increased risk of heart disease as well as other diseases like high blood pressure. For this reason, you should avoid trans-fats or keep them to below one percent of your energy source. (4) Trans fats have been thoroughly studied for their health hazard effect, to the point that New York City has banned trans fats from the fast food industry. Trans-fats also increase inflammation in the body which increases the risk of developing chronic diseases like diabetes, high blood pressure, heart disease and stroke. Trans-fats are found in many fried foods including doughnuts, fries, and deep fried and baked foods like cookies, cakes, biscuits, pie crusts, pizza, crackers and pastries. Trans-fats are also found in margarine and vegetable shortening. When polyunsaturated fats, like corn, soy, and safflower oil, are overheated, such as in deep frying foods, trans fats are the result. While for decades, saturated fats were assumed to be unhealthy, recent research has found that this is not always the case. Saturated fats have in fact been found to have many health benefits including boosting immunity, supporting repair of muscles and tissues and increasing testosterone levels. On the other hand, trans-fats which were previously promoted as a healthy alternative to saturated fats have been found to be grossly unhealthy. Trans-fats raise bad cholesterol levels and lower good cholesterol levels. These are prerequisites to atherosclerosis, high blood pressure and heart disease. Saturated fats are healthy while trans-fats are unhealthy. Therefore, while you should avoid trans-fats, you should include some saturated fats in your diet. However, you should still moderate total fat intake; otherwise you may still expose yourself to diseases like high blood pressure, diabetes and coronary heart disease.